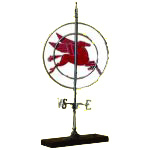 This antique weathervane features a red Pegasus, encircled with three metal rings. The N, S, E, and W letters are positioned below the circular weathervane emblem. This weathervane is equipped with a sturdy metal base.